Use the power of technology and the resources of the web to retrain your brain and make this year’s resolution a slam dunk. Smoking, unhealthy eating, poor sleeping habits, procrastination. What do these vices have in common? They can all wreak havoc on your mental and physical health, and they’re all commonly addressed through New Year’s resolutions. But breaking old patterns is never easy. Those neural connections are tough to unwire, and tougher still to rewire. Fortunately, there are ways you can turn your bad brain habits into a healthy routine. Here are four tips to help you train your mind to achieve new goals through persistence, intelligence, and technology. From master yogis to The Beatles, people have long been singing the praises of meditation. The good news is you don’t have to move to an ashram to experience the neurological benefits of this ancient practice. 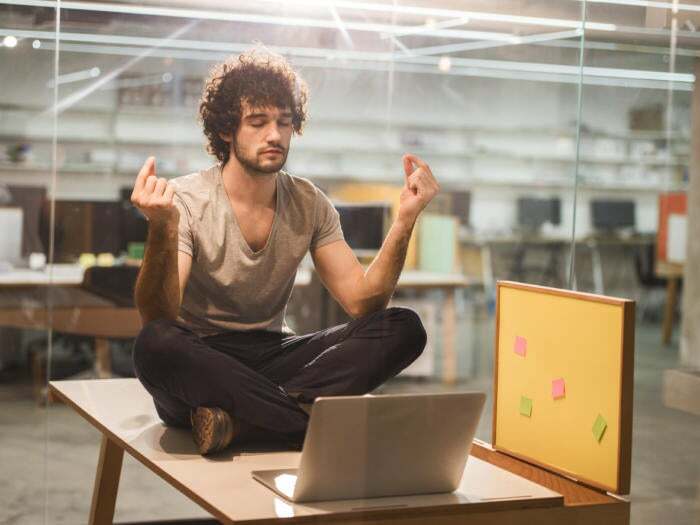 Thanks to innovative technology, there are a number of ways you can reap the rewards of mindfulness. Muse, for example, is a brain-sensing headband that provides deep-thinkers with real-time feedback on their brain activity. Armed with this information, practitioners can work on improving their meditation skills. Apps are another popular hi-tech tool for students of meditation. Breathe, Buddhify, and Calm all offer tips and tricks for re-circuiting your mind through meditation. Granted, it’s not always easy to find the right time or place to recalibrate your brain. Luckily, the Lenovo Flex 4 features a 360-degree hinge that converts the 2-in-1 device into a laptop, tablet or tent – whatever mode is most convenient for finding a quiet place to deep breathe. Negative self-talk can easily derail your dreams. But on the plus side, there are ways to retrain your thinking and convert that mental chatter into positive patterns. YouTube channels such as The Self Help Station, The Honest Guys, and Power Thoughts Meditation Club offer videos that allow visitors to listen to a steady stream of positive affirmations. Ranging from a couple of minutes to a few hours, these uplifting daily exercises can help you release negative thoughts and embrace a new attitude via your favorite device. Are you an avid fashionista searching for exciting trends? A passionate baseball buff looking to share your knowledge? Or how about a local business owner looking for tax tips? Whatever your interest, sites such as Meetup and Citysocializer allow like-minded individuals to share information, swap strategies, chat, or participate collectively in events and outdoor activities. In fact, some studies have shown that social engagement can actually boost brain function. That’s because interacting with others requires memory, attention, and control – mental processes that act like exercise for your brain. Challenge your intellect by signing up for an online workshop or enrolling in a Web-based education module. The Great Courses, LearnOutLoud.com, Lynda.com – they all provide instant access to audio and video courses on a wide array of topics, from the fundamentals of photography to mobile app development. Many of these programs are taught by professors and industry leaders for a fraction of the cost of college tuition or a certification program. Aspiring scholars that access these courses via high performance devices like the Flex 4 can count on a long battery life for uninterrupted study and a vibrant display to help keep you focused and energized.